Maharani Bharani Thirunal Lakshmi Bayi looks very self-assured in her portrait by Raja Ravi Verma. A firm jaw sits above her bare, polished shoulders. A strikingly simple, white fabric is wrapped under her arms. Her healthy hair is thick and lush. Unadorned, it falls straight, black, andendlessly behind her. 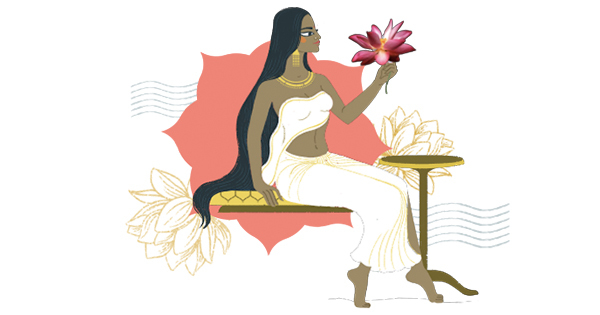 The year was 1857 when Lakshmi Bayi drifted into Royalty quite by chance. Having no female heir, The Travancore Maharaj at the time, resorted to adopting his niece to the throne. French naval officer, was quite taken by her charm and called her ‘representative of all the beauty of her race’. But praise like this did not come easy. Carefully crafted bathing rituals kept her hair thick, glossy and always fragrant. A home-made hair thali* was massaged into her hair. (*A thali is a green paste that is made fragrant by the addition of flowers like hibiscus and bhringraj (daisy). To it was added freshly ground methi and okra along with an array of herbs and seeds, like poppy seeds (khus khus), rosary pea, balloon plant and mung beans. This painstakingly crafted concoction was made of no less than 8 ingredients*). This nourishing blend that seeped into the pores of her scalp and thickened her hair shaft was this Queen’s version of a hair mask. Hair was then washed with dark red liquid that was made by boiling the barks of forty different trees. It was called naal-pamara-vellam, which literally translates into 'four-tree-water'. Once the bathing ritual was concluded, the Queen’s hair was softly dried with a thin, muslin cloth, as it was gentle on hair. The Queens herself was as strong as her tresses. When her husband was taken away from her and imprisoned as part of a conspiracy, the queen stood resolute in her undying love, despite continued pressure from her very own family. Although Lakshmi Bayi was royal by adoption, she came to epitomise grace, nobility and strength, that was celebrated equally by her subjects as well as the Brits. When the Rani's strong will and refusal to abandon her husband, amidst extreme pressure, reached the ears of Queen Victoria, she admitted her in 1881 into the Order of the Crown of India. Her story reached so far and wide that even when she visited Madras, sometime in the early 1880s, she was greeted by large crowds of people. Her will, like her hair, was not given to break easily. Add easily sourced ingredients like 1 hibiscus, (1 tbsp) okra, (1 tbsp) ground khus khus, (1 tbsp) ground mung beans and (1 tbsp) ground fenugreek to your hair care regime by mixing it with coconut oil and making a paste. Apply this paste to your hair for 1-2 hours. Rinse thoroughly. Use a gentle cloth to dry your hair, like a soft t-shirt or a cotton towel.